Six months ago I posted about an interesting piece of news – that NetSuite had inked a preferred partnership agreement with subscription and billing provider Zuora. The news was interesting because rival subscription and billing provider Aria was already a preferred partner of NetSuite (Disclosure – see relevant information about commercial relationships with all three companies here). 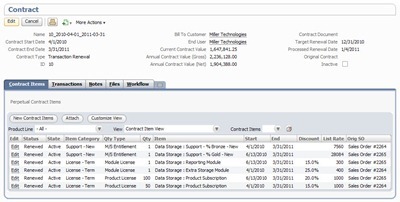 The new software brings automation and real-time visibility to the management of renewals, billing and complex contract management. By unifying these typically disparate processes into one software product, NetSuite delivers end-to-end contract renewal management software that reduces errors, enhances close rates, limits churn and brings a new level of efficiency to billing and revenue management processes. I had a discussion with NetSuite about the solution itself, and what it means for the previous integration partners, Zuora and Aria. According to NetSuite, both Zuora and Aria are still strong partners, NetSuite’s view on this offering is that it offers software companies a complete, end-to-end lifecycle management solutions for software. Their view on the Zuora and Aria offerings is that they have higher end capabilities for companies that have more consumer focused and higher throughput requirements in terms of billing and subscription. This is a really interesting play in that NetSuite is, to an extent at least, actively competing with its own integration partners. At the moment the solution is definitely simpler than that provided by either Zuora and Aria, but as the ERP with the most traction in the cloud, I’m betting that NetSuite is going to broaden the functionality of their subscription and billing so that the solution can meet the needs of all of their customers. Currently they’re pitching this as an ideal fit for SaaS software companies – I expect to see that broaden significantly over the months ahead. the subscription economy is here !!!! I don’t see this as being necessarily bad for either Zuora or Aria. The subscription economy is growing rapidly and, as the saying goes, a rising tide lifts all boats. I would imagine hat both vendors foresaw this occurring and regard the co-opition as healthy. Fact of the matter is that subscription and billing services were a little invisible – this product offering will do something to change that.